In a Civil Appeal preferred by Social Activist and Advocate Shri K R Koshti the Division Bench of the Gujarat High Court comprising acting Chief Justice Jayant Patel and Justice N V Anjaria directed the State Election Commission (SEC) to provide the option of NOTA (None Of The Above) on the Electronic Voting Machines in the upcoming local body polls in the state. The petition was filed seeking inclusion of NOTA in the polls for corporation, municipalities and panchayat slated to be held in two phases on Novermber 22 and 29 this year. The same bench had in August by its order stayed the provisions of compulsory voting in local body polls as sections of NOTA and compulsory voting were conjoined in the three Acts pertaining to Panchayat, Municipalty and Corporation polls. As the High Court had stayed implementation of compulsory voting and NOTA, the state election commission had this time not included the option of NOTA for voters. 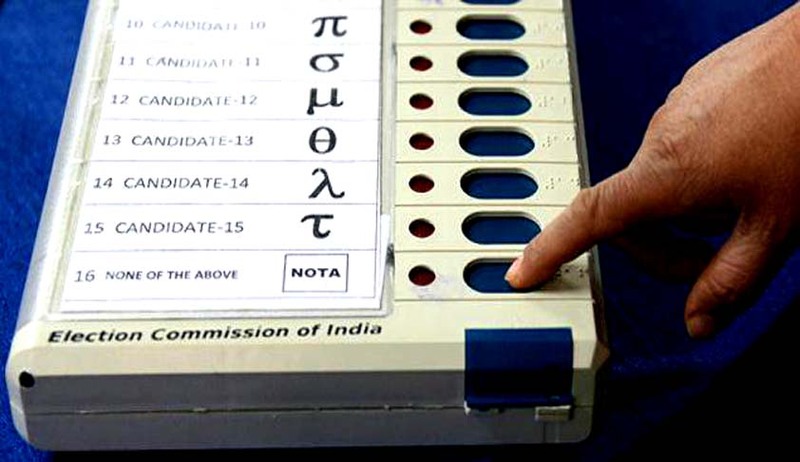 The counsel for the State Election Commission, Shri Mihir Thakore, argued that it is difficult to include NOTA at this 11th hour when there are only three weeks left for the polls. He averred that the facility of NOTA buttons in EVMs have been deactivated following the stay order on compulsory voting. He said if NOTA has to be maintained in 21 days all poll officers will have to be educated. Considering the facts and decision of the Supreme Court (regarding implementation of NOTA), we find that Right to vote in favour of none of the candidate is one of the right of voters and it is so identified and strengthened by the Apex court. Therefore interim stay (on compulsory voting) relief granted deserves to be modified to that extent (for inclusion of NOTA). ..Democracy being the essence in any democratic country, all the efforts for ensuring the elections and that too by making atmosphere available to voters for excercising right to vote and right to NOTA must be made by the Election commission," said the High Court. The High Court also directed the state government to provide all the necessary assistance to Election Commission to ensure free and fair elections and to supply sufficient man power to bring back NOTA buttons on the voting machines. The elections to six Municipal Corporations Ahmedabad, Vadodara, Bhavnagar, Jamnagar, Surat and Rajkot would take place on November 22 while those of 31 district panchayats, 230 taluka panchayats, 56 municipalities would take place on November 29. The counting votes would be held on December 2. According to the reports of Webindia the court’s decision directing the SEC to provide NOTA option to the voters is considered a major setback to the BJP because the Patidar Anamat Andolan Samiti (PAAS) and the Sardar Patel Group (SPG), the two organizations of the upper caste Patels spearheading the agitation for reservation in jobs and education to them on par with OBCs, have appealed to their supporters to use NOTA to teach the ruling BJP a lesson. The Patels are estimated to comprise 18 per cent of the state’s population.